Adam Scott is one of the most talented Golf player in the world. He is rom Australia who has achieved No. 3 Ranking in the official World Golf Ranking in 2007. Here is the complete information regarding Adam Scott in this article - about his career, profile and records. Adam Scott is an Australian professional gol player who was born on 16 July, 1980 at Adelaide (Australia). He become professional in 2000 and has won 18 professional golf tournaments till now in different Golf Tours like PGA Tour, European Tour, Asian Tour, Sunshine Tour and PGA Tour of Australasia. He is also the winner of 2011 WGC-Bridgestone Invitational, one of the five World Golf Championship. Scott won 2002 Qatar Masters, which he again won in 2008. In 2005, he won three different tournaments. He also become the winner of the 2005 Order of Merit on European Tour. 2006 was even better for him as he reached to the Top 10 of two different major championships. He ended up on Tied 3rd position in The Open Championship while Tied 8th position in PGA Championship. After winning Mercedes-Benz Championship 2007, he reached to his career best ranking of No. 3 in Official Worl Golf Ranking. Year 2011 was very fruitful for Adam Scott, as he won his first World Golf Championship tournament at WGC-Bridgestone Invitational. He beats Luke Donald and Rickie Fowler with a score of (62-70-66-65=263). He also achieved his best performance at any major championship till date when he ended up on Tied 2nd position in 2011 Master Tournament. 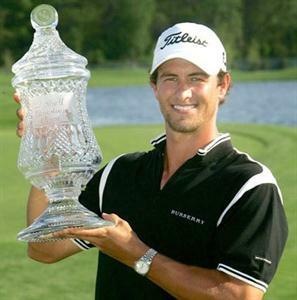 Adam Scott has also appeared in President Cup for five different years - 2003, 2005, 2007, 2009 and 2011. His other Team appearance came at WGC-World Cup 2002 where he represented Australian Team.